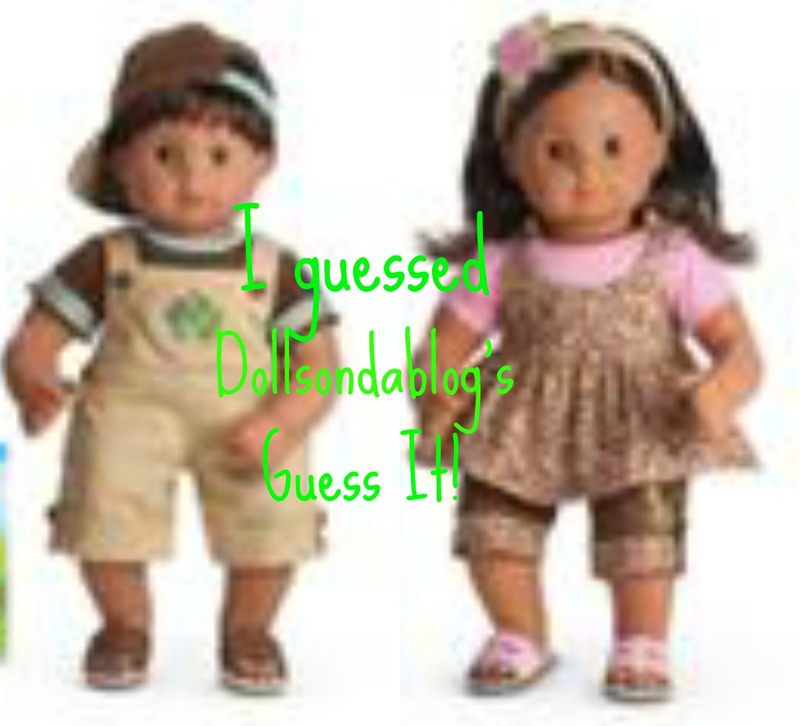 New Caption that Doll Picture! 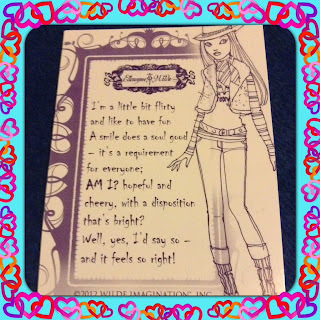 Wilde Imagination "Prudence-Am I" Review! Hello! 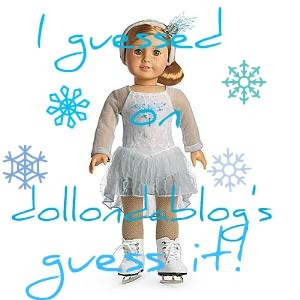 Today I am reviewing a doll from Wilde Imagination. Fast facts about "Prudence-Am I?" 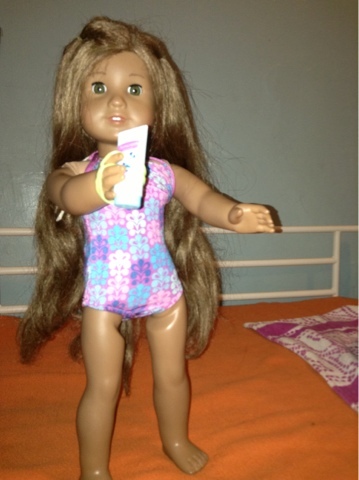 Prudence has 12 points of articulation. That is how dolls can pose in certain ways. The name "Am I?" came from a part of the poem that came with her. The box was very pretty and easy to open. It was gold and had the words "Wilde Imagination". I really liked that it was really easy to get her out of the box. I only had to untie two ribbons. The outfit Prudence came with has a vest, 2 shirts, a pair of jeans, a pair of gray socks, a pair of gray high heeled boots, a gold belt, gold shimmery stockings, a striped scarf, and a gray hat. One shirt was short sleeved and gold and had the word 'Foxy' on it. It is really nice. The other shirt is long sleeved and it is charcoal gray and gold. Maddie looks pretty nice in that. I really like the outfit because I can mix and match with it. I have a hat that is very similar to her's! I also liked the fact that Prudence came with a doll stand. I find it much easier to have her stand up to pose. Prudence has very silky hair. She also has painted finger and toenails. The nails are kind of a rosy pink. Those are very important and nice details. And another useful feature is that instead of Velcro, there are several snap buttons! This prevents doll hair from sticking. I think this is brilliant. Hi guys! I have been awarded by DollyGirl Treasures and Photography by Rachel H.! Because I recieved the same award from two different people, here are my answers for both of them! 1. 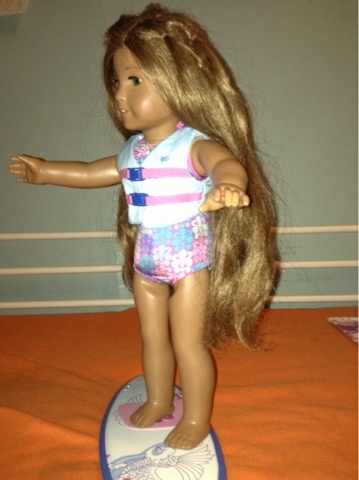 If you could create any American Girl doll, what would she look like, and what would her name be? She would have caramel skin, chocolate brown eyes, and dark brown textured hair. She would be a Historical Character from the 1700's and her name would be Elizabeth Lydia Granger. 2. 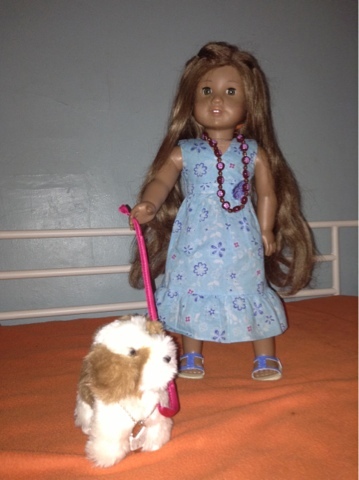 What American Girl dolls do you have? 3. 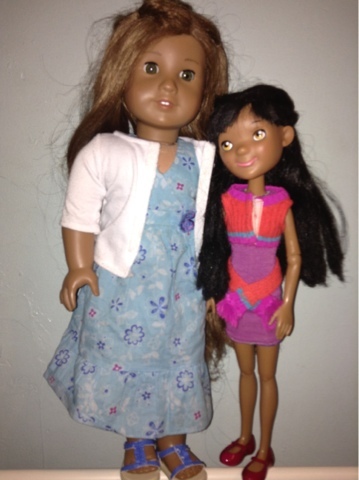 Do you have any non-AG 18 inch dolls? 4. What is your absolute favorite brand of dolls? American Girl, Little Miss Matched, and Ellowyne Wilde! 5. What is the next doll (AG of non-AG) that you want to get? I'm going to win Saige.... soooo.... JLY 46 or Ivy! 6. 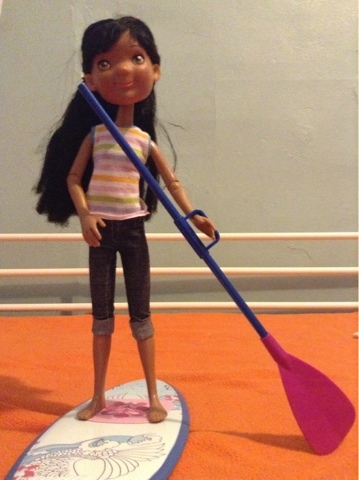 What is your favorite thing to do with your dolls? I like to take pictures of them and do their hair. 7. Do you have a place for your dolls, like a corner of a room, where their's beds and stuff? 8. Would you rather use the computer/watch TV/play on your phone of electronical device/play video games or play with your dolls? 9. If your parents told you that you could only have one doll, what would you do? Do anything to have more! 10. 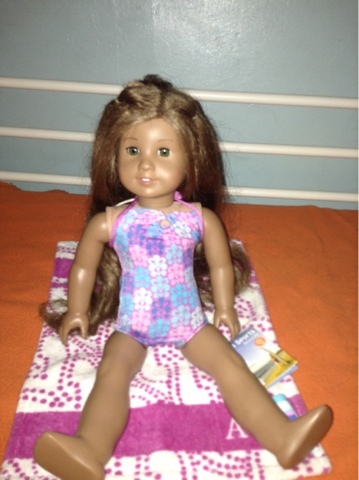 Have you ever found an American Girl brand item (can be anything) at a second-hand store? 11. 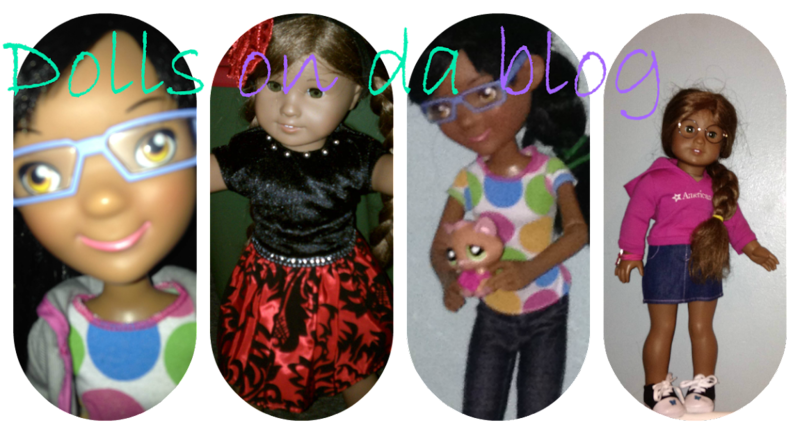 Do your friends share your love for dolls? 12. 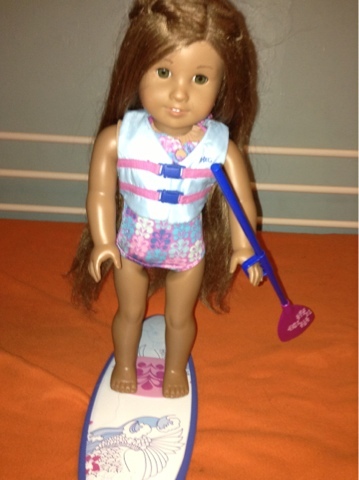 What is your favorite non-AG doll brand? Elloywne, Little Miss Matched, Kids 'n' Cats, and Springfield! 13. Where do you get your inspiration? 14. 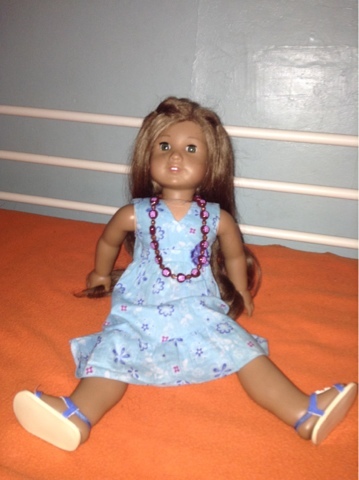 Does anyone in your family share your love for dolls? 15. Where did you get the idea to start a blog? And the next 7 people who comment that has a blog! 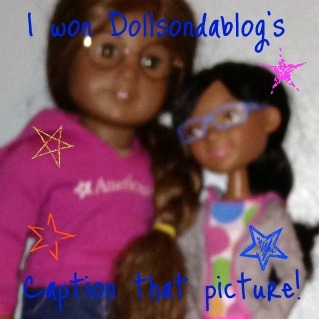 We got awarded by Samantha of Forever American Girl! Here are the questions that me and Maddie have to answer. 1. 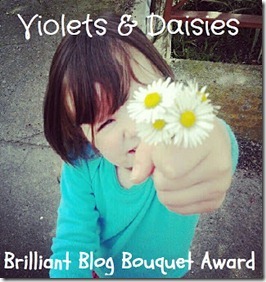 If you could have a "flower pen name" like we have here on our blog, Violets and Daisies what would it be? 2. What is your favourite ever Bible verse and why? We like all of them! What she said. Australia and England! G'day, mate! The Delightful world of dolls! Whoever we awarded must do a post like ours and accept our reward! Kanani- Oh, Marie-Grace, you're breaking Constatutional law! Kanani- You ate the last cookie. (Constition hanging on the wall)Kanani: Okay, Marie-Grace, time to learn about the Constition!! Marie-Grace: Do I have to? Kanani: Yes, you do. This is very important. Marie-Grace: But we aren't even in real school!!! This is SO unfair. I don't think I have to learn about today. Kanani: UGH!! Fine. I'll just stop. Go. Gosh, I wish she would come back, this is very important. Marie-Grace:YES!! I'M FREE!! I'M FREEE!!! I'M FREEE!!! Kanani: What does 'duh' mean? Marie-Grace: Oh brother, why can't I have a nice American sister?! Kanani: What's this weird thing on the wall? Kanani: Um... no, my eyes are closed. Marie-Grace: Then how did you know that it was on the wall? Kanani: I don't know. Maybe I have magical powers! Vote away on your favorite until next Wednesday! Hi readers! Not too long ago, Human had us do a stopmotion. Well, sort of. She just took a bunch of pictures on an app then the app strung it together. Comment TV if you can see it! 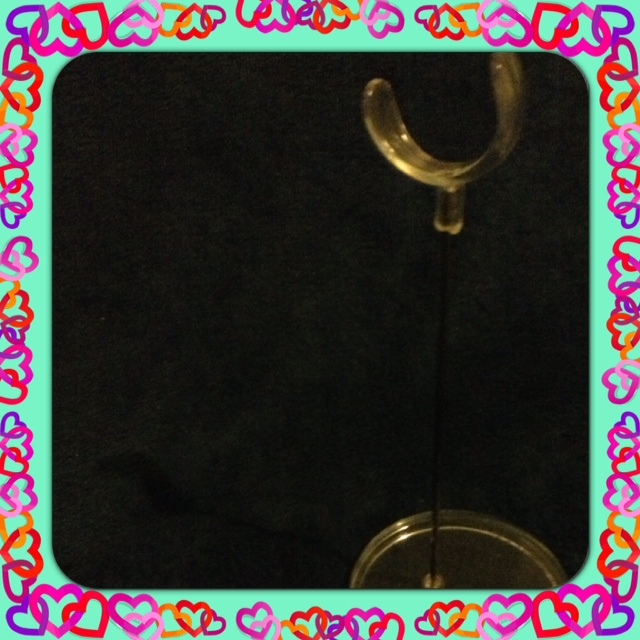 Here is another one that she made. Comment Maddie is awesome if you see that one! Hey! There is the guess it! And the next Guess it! P.S. For the 10th guess it, there is going to be 6 of them! Guess who got a new bed? HI! I AM LIKE THE MOST HAPPIEST PERSON ON THE BLOG! So? Someone's sore. Like who? You know. Just get onto the news! Sheesh! Don't be such a grumpy pants! Stop raining on my nice parade. JUST GET ON WITH IT! She is being very grumpy. Anyway, HUMAN MADE ME A BED!!!!!! Awwww! It won't show up! When Human takes a picture, I'll post it here. AAANNNNDDDDD the next Guess it! You have until next Sunday to guess it! EDIT: Here is the color version of the guess it! We were soooooooooooooooooooooooooooooooooooo busy this past week. 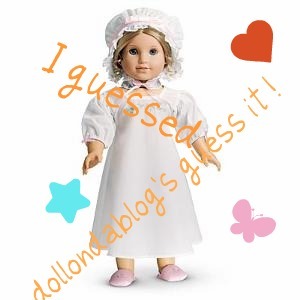 Anyway, here are the poll results for the Caption That Doll Picture! Submit your captions by next Saturday! Human and her sister will choose the funnies 3, as usual. What did I say about finishing my sentences? You're not my owner. Human is. Fine. Don't forget to submit your captions! Hi! Here is the review of Kanani! I hope to do Maddie next week! 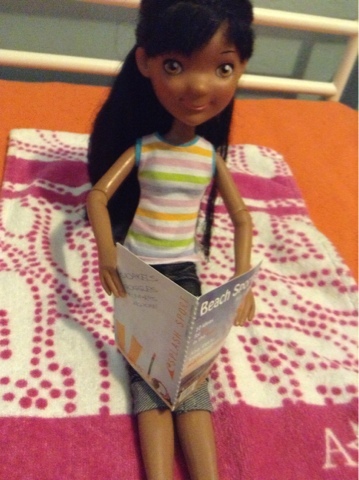 Here is Kanani sitting on her beach towel. 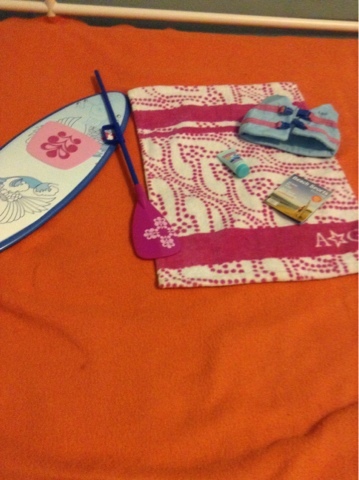 The beach magazine came with her paddleboard set. Meanwhile..... HEY! Your took my towel! So? All in all, Kanani gets an A-. Her hair is kind of hard to take care of. Otherwise, she is the best doll ever! Why thank you! Doesn't it look awesome? Gotta go now. 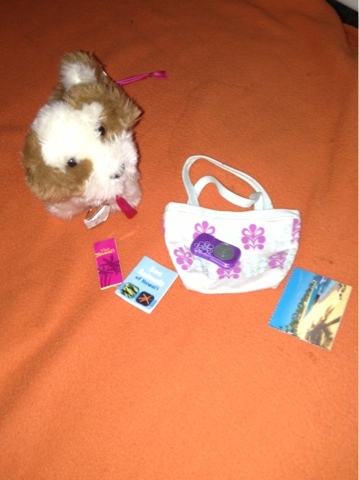 Human said that she will post about Maddie's outfit of you want her to. Also, she will review me sometime this week. Catch ya later!